Between the two versions and their odd restrictions, a swappable processor, and a new experience which might be a new version of Windows, Microsoft's Surface Hub 2 is unexpectedly intriguing. Microsoft is refining its plans for its next-gen Surface Hub 2 collaborative display, separating the product into two distinct “experiences” that will require users to install an upgraded hardware module to enable. But here’s something that may rile some businesses: certain basic features like rotating the display will be reserved for the new, upgraded Surface Hub 2X model due in 2020. The two new models—the basic Surface Hub 2S, and the upgraded Surface Hub 2X — will share the same common hardware, according to Microsoft. To upgrade to the 2X experience, administrators won’t buy a separate device. Instead, they’ll be asked to buy a dedicated swappable “processor cartridge” that also contains the operating system for the second 2X experience. But there’s a catch: The 2X experience will support dynamic screen rotation, multi-user authentication, and other features that will not be permitted within the 2S. It’s a seemingly odd way to entice users to the Surface Hub 2, which Microsoft originally announced in May. The 50.5-inch Surface Hub 2 will boast a “4K plus” display in the traditional 3:2 ratio of Surface devices, and can be rolled on an easel or mounted on a wall in a modular fashion to create a “wall of pixels.” PCWorld was told that the Surface Hub 2 received immediate demand from customers. That, according to Surface spokesman Ryan Day, is partly the reason for the two models. Microsoft has stopped making the original Surface Hub, and has essentially sold out of its original inventory, barring any remaining units that may be within a distributor’s warehouse, he said. That means customers will be forced to wait until Hub 2S shipments begin—though Microsoft believes the deliberate pace of corporate purchasing makes this less critical. Specifically, Microsoft plans to ship the 2S in 2019, but hold the 2X for 2020, potentially two years away, Microsoft is expected to say at its Ignite conference this week. 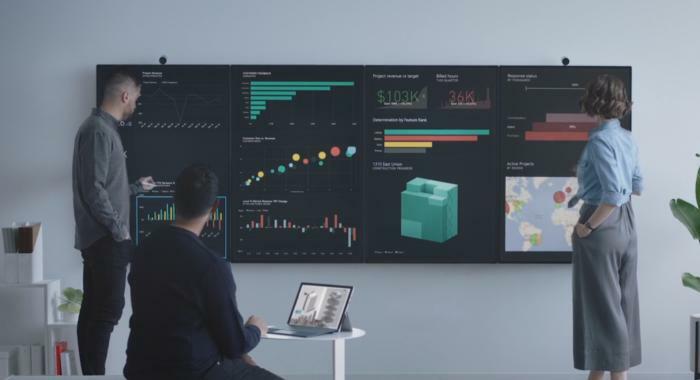 Several Microsoft Surface Hub 2s can be placed side-by-side to create a “wall of pixels”. Currently, the Microsoft Hub 2S will run the existing Hub experience, which Microsoft is orienting around Microsoft Teams. The 2X experience will be predicated on something new, about which Microsoft will share more details in the coming months. (Many think Microsoft has a revamp of Windows behind the scenes, known as Core OS, that could be the foundation of this upgraded Surface Hub 2 XS. Day declined to comment on what he called “rumors and speculation.”) Microsoft describes the Hub 2S as a transitional hybrid device as companies move from on-premises data management to trusting the cloud as a corporate data repository. Microsoft isn’t saying what the new compute module or processor cartridge will look like, exactly what will be inside of it, what its price will be, or when exactly it will ship. It will apparently include a new CPU, a new GPU (which could be integrated into the CPU), and some form of storage housing the 2X experience. Microsoft also isn’t disclosing any other features about the Hub 2 hardware until later this year. As for the odd separation of features between the 2S and the 2X experience, Day explained it as another element of the corporate purchasing cycle. 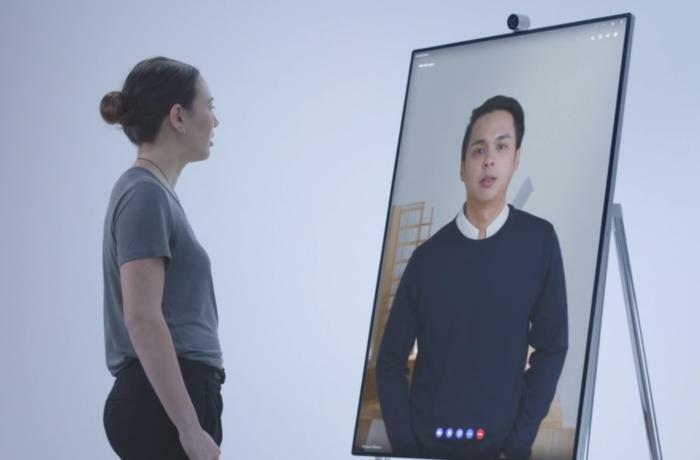 When Microsoft looked at prioritizing those customers, the company decided to focus on the first-generation Surface Hub experience with the second-gen hardware, Day said. That meant holding features like screen rotation until the 2X iteration. If Microsoft were making the same decisions about a Surface tablet being sold to consumers, “it would be a vastly different conversation,” Day said. The Surface Hub 2 is designed to introduce realism into the conferencing experience via life-sized displays and easels. One thing’s for sure: The odd transition between “experiences” will be just one of the more intriguing elements of the new Surface Hub 2. What this means: Normally, we wouldn’t expect a general consumer to buy a Surface Hub, and maybe not even interact with one. But the way in which Microsoft is asking businesses to wait for the Surface Hub 2, then upgrade via a swappable processor module, to a new “experience” which may represent a new version of Windows—well, those are three things worth talking about, in our view.